Today, Parkscope correspondent MrEPCOT visited Universal Orlando Resort to check out the first phase of the new Promenade which opened recently. There are currently 2 other phases under construction in various stages. The first phase blends in seamlessly with the existing CityWalk infrastructure and really adds aesthetically to the area. 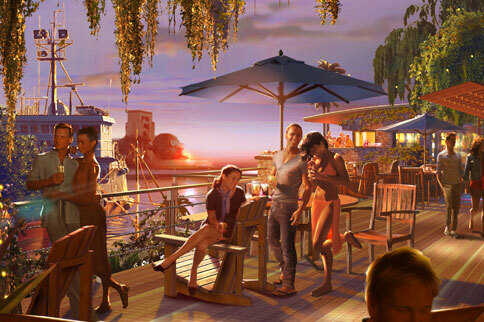 As you can see below, the first deck to open features an outdoor daiquiri bar and some retail kiosks. The deck itself looks to be cedar (or a convincing substitute) and has a beautiful, rich finish. The finished product is very pleasing to the eye. Phase 1 from the other side. There was originally some fear from Universal fans that too much green space would be lost. That appears to not be the case. While some trees were removed, others were added and Universal has even worked around existing palm trees. The area has been landscaped well, and the area will only get prettier as plants grow in. This deck is just the first of many coming as part of the CityWalk Promenade expansion. So far, it looks like CityWalk is getting a nice addition that will enhance the experience of day guests and resort guests alike. The Promenade will be the perfect place to stop on your way in to Universal Studios Florida in the late afternoon to catch the new parade or Cinematic Spectacular. It will also be a great place to pregame with your friends or family for Halloween Horror Nights. It will be interesting to see if the other decks have dining and/or other options. Universal has kept a tight lid on the project. Hopefully, they will announce details soon. Follow @Parkscope on Twitter for updates. You can also discuss this addition at Orlando United.